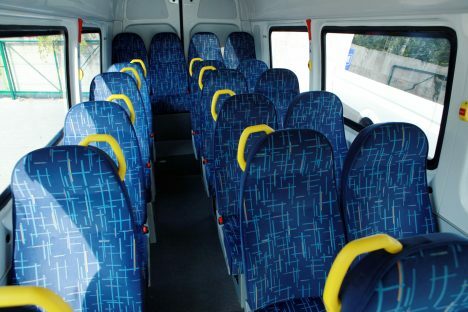 AS Liepājas autobusu parks and AS Nordeka, which had previously submitted numerous complaints about SIA Rīgas satiksme’s organized minibus transport services procurements, have decided to no longer participate in them. With that, the only contender that has applied for the most recent one is Rīgas mikroautobusu satiksme. At the end of August, the Supreme Court satisfied the side plea submitted by Liepājas autobusu parks and Nordeka in the criminal case regarding the procurement organized by Rīgas satiksme. With this decision, the Supreme Court declared it impossible to continue the procurement procedure without amending two of its points – evaluation of contenders’ proposed ticket system and evaluation of their financial offers. Rīgas satiksme representative Baiba Bartaševiča-Feldmane explains that the company has performed all the necessary improvements and that a new talk procedure was initiated at the beginning of September. Nevertheless, Liepājas autobusu parks decided not to participate. «Only one contender has submitted their offer in the talks procedure – Rīgas mikroautobusu satiksme. Application submission concluded this week. If the contender’s office meets provided requirements, the contract for provision of minibus services in Riga will be signed with them,» says Bartaševiča-Feldmane. Liepājas autobusu parks management board member Leonīds Krongorns says that after the last verdict of the Supreme Court, his company concluded there is no way to win in this procurement. Because of that, the company has decided to not participate. «We lost because the court decided to leave in all the points we tried to appeal. The verdict was allegedly beneficial for us, saying that there should be competition. However, after reading through the rest of the points detailed in the procurement, we still lost,» said Krongorns. The Supreme Court ordered halting the additional agreement between Rīgas satiksme and Rīgas mikroautobusu satiksme on extension of the contract for provision of public transport services from 1 January 2019. This means that if the offer from Rīgas mikroautobusu satiksme is found appropriate, Rīgas satiksme will have succeeded completing the procurement procedure before the court’s established term even though previously there were concerns that Rīgas mikroautobusu satiksme’s minibuses might leave Riga’s streets for good. Even now minibus services in Riga are provided by this company. This procurement keeps going since 2016, when Rīgas satiksme first announced a talks procedure for minibus services. Two contenders were picked initially: Rīgas mikroautobusu satiksme and an association consisting of Liepājas autobusu parks and Nordeka. Even though this talks procedure was already underway, Rīgas satiksme and Rīgas mikroautobusu satiksme signed a side agreement 31 May 2017. According to it, services detailed in the procurement would be provided until 30 October 2020. Liepājas autobusu parks then turned to court, asking this side agreement to be declared void, because it was signed outside the public procurement procedure. The company asked the court to apply an interim solution – prohibition of the side agreement. The court satisfied this plea, adding that the side-agreement is illegal and its function should be halted as of 1 January 2019. Only Rīgas mikroautobusu satiksme, Liepājas autobusu parks and Nordeka were allowed to submit offers during talks procedure. However, Liepājas autobusu parks submitted a total of six complaints in relation to the requirements put up by Rīgas satiksme. The Procurement Monitoring Bureau satisfied all six complaints. To win public tenders in Riga the one needs to be ready to circulate part of money, know right persons. That’s why many companies don’t even want to participate public tenders in Riga. Waste of time and money. Pre arranged ”tenders” or then requirements are almost copy-paste from the wanted winner. Nobody is brave enought to clear that sh…. Sad fof tax payers after all, and bad for image of Riga.